Dr. Stanfield received his bachelor’s degree from Westminster College in Salt Lake City and then moved his family to Philadelphia where he earned his doctorate from the Temple University Kornberg School of Dentistry. He is a current member of the WhiteCap Institute of Implant Dentistry. 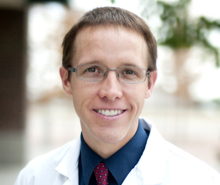 Dr. Stanfield grew up in Heber City, Utah enjoying the outdoors. He and his wife are the proud parents of a little boy, a little girl and two dogs. His family enjoys snowboarding & skiing in the winter and mountain biking and boating during the summer. He feels very fortunate to be able to live and practice dentistry in this great state. He has attended many continuing education courses on implant dentistry and enjoys the artistic aspect of dentistry. He takes pride in being able to provide the highest quality dentistry for his patients. The Academy of LDS Dentists. Dr. Stanfield practices in the Syracuse location. "Going to the dentist is generally not something that most people look forward to doing during their busy day. I really enjoy being able to ease patient anxiety and make them feel as comfortable as possible while helping them with their dental needs. I love to see the happiness that comes when a patient sees their brand new smile after years of having an un-esthetic crown or after they have had an accident. As a child, I knocked my front tooth out while riding my bike, so I can fully appreciate the care that goes into restoring a smile back to the way it was. I treat every patient as if they were a member of my family. I feel that is the only way to do dentistry. I strive each day to provide the highest quality dentistry. When you are in my chair, I promise I will treat you with the all the respect and professional courtesy that you deserve."